Group Lessons | The leader in Ballroom dancing! 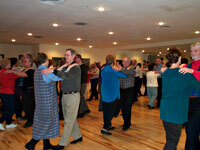 Group Lessons – The leader in Ballroom dancing! Group classes are also available and offer the dancer an economical price. After a long day at work, get the benefit of learning in a fun and relaxed environment. Our philosophy is to get you out on the dance floor having a good time fast. Classes are scheduled on a weekly basis and are one hour each week. Please ask for the latest class starting dates and times. Beginner I: This is where you start! Get the basics. Learn the classic Foxtrot, Latin Merengue, Disco-Hustle and Cha Cha Cha. Learn a variety of dances so you can get out of your chair at that party and dance! We have you dancing around the room the first hour! No pre-dance knowledge is required. This is designed for the absolute beginner in mind. Come and have fun. Classes are eight weeks, one hour each week, $80 per person. Make sure you sign up in advance! Dress comfortably and bring a smile. Beginner II: After you get the basics from Beginner I, we add to your repertoire of dances. You learn the beautiful Waltz, passionate Tango, slow romantic Rumba and lively Swing. Think of all the fun you can have on the dance floor! Dance to the music you hear on the radio every day! Classes are eight weeks, one hour each week, $80 per person. Again, please sign up in advance. ~ Group classes are prearranged according to the class schedule. Ask for the latest schedule today. (Please sign up in advance as there are minimums we need to make the classes go) We require a $15 deposit to hold your spot for your class. Classes missed are forfeited due to the nature of pricing and scheduling. Thank you for your understanding. Every month we have a 3 hour Dance Party. Practice what you are learning in the classes and meet other fun and friendly dancers! There is also a 30 minute Intermediate lesson at the beginner of each party. Only $5 per person. Usually the 3rd Friday of each month from 7-10pm. Check out “CALENDAR” page for starting dates! Learn the Foxtrot, Merengue, Hustle and Cha Cha Cha. We have new classes starting all the time! Check out “CALENDAR” page for starting dates! Learn the Waltz, Tango, Rumba and Swing. New Classes Starting all he time! Check out “CALENDAR” page for starting dates! You learn Samba, Mambo, more Rumba and Foxtrot! 3 weeks – $33pp / 4 weeks – $44pp! BRIDE AND GROOM SPECIALS GOING ON NOW! TAKE A LOOK AT THE BRIDE AND GROOM PAGE FOR MORE DETAILS. Cannot be used with any other offer. Only can be used once per student. ~Recommended attire: A suede soled shoe works well. For more serious dancers, check out our link for ballroom dance shoes. Dress in comfortable clothing and get ready to have fun! Please, no street shoes on dance floor! IS THERE A CLASS YOU WANT TO SEE WHICH WE ARE NOT OFFERING? DON’T BE SHY, SEND ME AN EMAIL AND LET ME KNOW! I’m interested in beginners classes for me any boyfriend we are interested in swing but would like to try any classes. My number is 919-291-1135.